Dearest reader, before you begin, we must explain that whatever we manage to write, couldn’t possibly even begin to begin to capture the experience we’ve had today. We started off the day with a Starbucks run. Yesterday we learned that the earlier triple shot lattes got into our systems, the better we work. It was our fourth day in Washington, D.C. and we were beginning to get the swing of things. I was feeling less like a tourists in the bustling city of Washington, D.C. and more like a participant of the workforce dressed in ironed slacks and a crisp blouse. Honestly, I was beginning to feel a bit over confident. But by the time we arrived at Rayburn House Office Building, I was straining my neck looking up at the large shiny buildings that hosts the Members of Congress who make so many decisions that affect our nation. I once again felt like kids in a candy store. 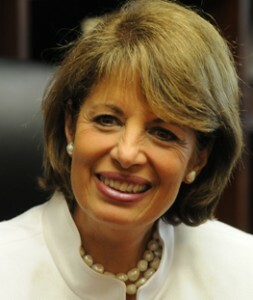 Our day began with a stimulating interview with Congresswoman Jackie Speier who just began her tenure in Congress in April after a special election to replace the iconic Tom Lantos who died while still in office. New to town and in the middle of voting, she managed to take the time to meet with our group. The scale of the Rayburn Congressional Offices was intimidating up until we got to Jackie Speier’s office. It just so happened to be her birthday and balloons and flowers were bursting out of her office and lightening up the marble hallways. Jim McDermott is a man of conviction. Broadly traveled, he has been to 80 different countries, and visited India on more than 20 different trips. He has made many friends through his travels in China and has spent time living in Africa. He emphasized the importance of travel and because it creates a deeper perspective. You can only really understand how lucky Americans are when you are outside America. He believes that the lack of knowledge about other cultures and their customs, cultures and governments is one of the root causes of conflict. The only way to amend this problem is to travel to these different places and discover how they function from a personal perspective. On top of that direct communication with people is the key to building relationships around the world. “Humans are social creatures and when our communication is blocked then we lose a portion of our humanity.” Jim McDermott is a wonderfully articulate man who communicated his point quickly and coherently. He is a family man who believes it is equally important to maintain healthy relations with family as well as his global community. He stated that every day that he leaves work; he devotes his time to his family. He is in Congress to make decisions that will benefit America and his family. What’s right for America is echoed in what’s right for his family. After the listening to the sentiments of Congressman McDermott, a busy politician, it stuck me how I sometimes take my own family for granted. “Is this your tripod!” said a tall, heavy set security guard who stood in front of me at the entrance of Longworth. I turned back to the guard and timidly said “yes.” He began a thorough search of my bag. When he realized that the tripod was in fact just a tripod, he allowed me to enter the building. The ordeal put me significantly behind the rest of the group so I had to run to catch up. While the camera and tripod bounced off my legs as I ran, I thought, “What a great start to an interview.” When I walked into Congressman Jim McDermott’s office he was waiting for us to get started. He seemed impatient, like he was by obligation, his first remark was, “I’m only doing this because Congressman Farr asked me to.” Chris asked Congressman McDermott about a picture on his wall of Gandhi, I think that he was impressed with our spontaneous. He began to warm up to us. 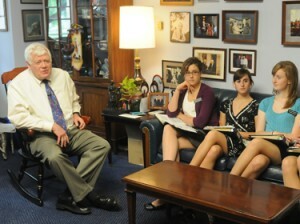 By the end of our time together it seemed we had earned at least some of Congressman McDermott’s attention. He showed sincere interest in answering all of our questions despite his very patient assistant who was anxious to get Congressman McDermott to his next appointment. He left us with one last piece of advice; follow your passion, do what you want in life and not what others want you to do. The few minuets that we had with McDermott opened my mind, and solidified what had been told to us in numerous ways and through many different sources. The message is to learn about other cultures and realize that despite having different languages, cultures and religions, we are all connected. I was wishing I could have a chance casual conversation with some members of congress while we were on the steps of the Capitol Building. Amita and I were inspired by Jim McDermott’s advice to, “not wish you could do something, do it!” We summoned our courage and spoke to Dennis Moore from Kansas’s 3rd District. We approached him, not knowing who he was or what we would say to him. In the end, Ward had to drag us away from our conversation with a man clearly filled with passion and dedication to his job. As he spoke to us about the bills he sponsored regarding the soldiers in the Iraq war, he was swelling with emotion and it was obvious he really cared about what he was doing. When asked about his motivation, he pulled out his Blackberry and showed us a picture of his grandson. It was great to see someone with such dedication to public service with genuine motivations. Unfortunately, our interview with Congressman Sam Farr was cut a bit short because he had to rush down to the floor of the House to vote. The buzzers started going off at 10 minutes before the vote and he left with less than 3 minutes. He delayed to the last second. I am sure he has it timed perfectly form long practice. However, for once “time was not everything” because even in those few short moments, he shared some really important points. He said, “Life is about empowering people”, and clearly this is how he engages with the world. His aim as a Congressman is to give his constituents the ability to say what they want from the government and make sure it happens. It was a boldly unselfish statement that really affected my heart. If we all lived just to empower others, we could create a world where everyone believes in themselves and their potential. A world where people know and reach for their capabilities is a beautiful idea where anything is possible. His other piece of advice that connected as first steps in creating a better world was to, “Find what’s broken so that you can fix it”. We must identify and pinpoint the issues so that we can work towards finding solutions. So, to change the world, we must first understand the importance of the individual and then as Sam told us, “give something back” by working towards fixing the broken pieces of society. And what was Congressman Farr’s advice for taking this on? “Just follow your hearts” because “you are all going to make it.” I felt empowered. The one two punch of Congressman Sam Farr and his very skillful scheduler Tom Tucker has opened many doors for the Mount Madonna students over the years. Sam’s trust in the students to engage in a meaningful way with his colleagues in the House is a trust that we cherish and protect. It is also an act of the “empowerment” that Sam talks about with the students. The access that they have earned and been granted in Washington, D.C. says that, yes they are worthy of the time of busy and important people, and that they are valued for who they are right now. Congressman Farr has conferred both a blessing and a challenge on these students. The blessing of access is the opportunity and the challenge is to live up to what he knows they can do. He is a mentor of the first rank. 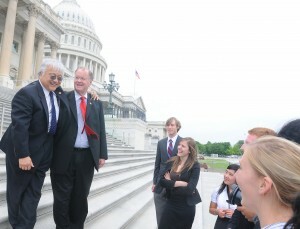 I have also noticed Congressman Farr is liked or even loved by just about everyone we meet on Capitol Hill. I think it fair to say just about everyone who meets Congressman Farr gets the feeling that he cares personally about who they are and what they need, and that is because of the simple truth that he does! 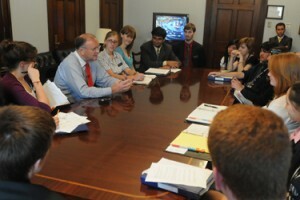 I think the Congress is a better more civil place because people like Congressman Farr are there. His authentic and caring personality and his deep commitment to providing for the basic needs of the people he serves, namely “a decent place to sleep, access to medical care and an education” seem to be at the core of everything he does. This may not make the evening news often, but it definitely helps the work of fixing what is broken in our society. I have come to refer to Congressman Farr affectionately as “Uncle Sam,” I think it fitting both in terms of the sense of family that has developed between Sam and my students and emblematic of the national icon of Uncle Sam who personifies the values of what make this a great country. Having finished our somewhat shorter that unusual, yet wonderful interview with Congressman Sam Farr, we exited the Longworth House Office Building and at our teachers suggestion headed up the street towards the Capitol. The interview had ended due to a call for a vote in the House. Mr. Mailliard explained that if we waited by the Capitol steps we could see most of the Members of Congress coming down the steps after the vote. We gathered at the steps, watched the heavily armed guards look at us with expressionless faces, and waited. Finally the members of Congress to pour down the front steps like I had seen in so many news reels. They proceeded to travel in different directions like a colony of bees exiting their hive. We spotted Congressman John Lewis and decided to say hello. Congressman Lewis is man of amazingly charm. 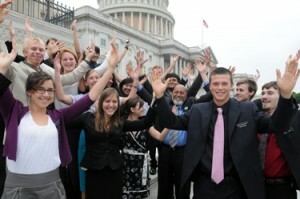 “I can’t wait to see you next week!” I was astonished at how easy it was for us to stop legislators and talk to them. It made me realize that these people weren’t superstars, they weren’t the same pundits we saw in the news, they are people who representing us. Congressman Ed Purlmutter of Colorado actually started to interview me! He asked what my values were, and I was almost too shocked to respond. After quickly reciting the three pillars of Mount Madonna School he continued to eat his Klondike and ask us about our Values program. My conversation with him made me realize that this city wasn’t some sort of impenetrable fortress that all the security makes it out to be. The way to crack this city, is with courage, preparation, charm, and a little bit of luck. When our favorite Congressman, Sam Farr came down the stairs we rushed up to greet him as if we had not just left him 40 minutes earlier. He was joined by Congressman Mike Honda and they told jokes and entertained us for a minute, then Congressman Farr in his wonderfully generous way said, “You want to go inside?”. After 20 minutes in the visitor’s gallery with Congressman Farr explaining the rules and process of the House it was time to go. As we were leaving Congressman Dreier of Southern California came up to talk with Sam and kindly invited to sit in on a meeting of the Rules Committee. As we came in, there was a moment when things stopped and we were introduced to the room as students from Congressman Farr’s district and our teacher Mr. Mailliard was introduced as the son of former Congressman W.S.Mailliard. As if watching the debate was not special enough, Congresswoman Slaughter, the chair of the Rules Committee, took the time to explain the issues to us, something that I’ve been told is unprecedented in the history of the Committee; first our mere presence in the chamber, plus the most powerful committee members in the House addressing us- mere students! To be recognized was an honor. Then a very partisan argument began and a series of procedural votes took place right down party lines. They kept pointing to us and referencing the fact that our generation would have to pay the cost of the war. By the end, an equal number of emotions rushed in to fill me; awe, excitement, inspiration, euphoria, honor, and did I mention awe? To see world leaders, not ten feet from me debating the types of issues we read about in the newspaper, speaking so eloquently and with such obvious intelligence, I was finally struck with the realization that these people are real. Seeing actual people, right there in front of me, I realized that government IS people. We thought that our day could not get any better, but it did. Congresswoman Slaughter invited us into the Rules Committee’s office. She spoke with us, speaking of how we, as students, held the future of the nation in our hands. Following our conversation with Congresswoman Slaughter, Congressman Dreier, who had blessed us with the invitation into the Committee Meeting, explained to us issues, such as the House Minority’s extreme difficulty in expressing itself in policy, and relayed to us a delightful story of his recent trip to Columbia. He was playful, charming and very obviously intelligent. He skillfully and patiently explained his ideas to us. 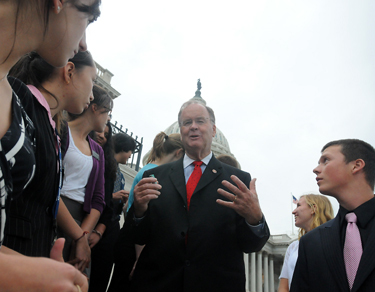 Congressman Farr then took up on a private tour of the rotunda. Standing between the House and Senate, beneath the great dome, my feeling of awe topped out. Words cannot describe what it was like to look around, see hand-carved statues, meticulously crafted paintings adorning all of the walls, and the symbolism present in every last detail. When our tour ended the group reconvened with Congressman Farr on the steps of the Capitol. We were freaking out, literally jumping for joy and hugging each other, energized by what we had just witnessed. Congressman Hastings of Florida, who had been present at the Rules Committee meeting, saw us on the steps and came over to join in our conversation with Congressman Farr. Congressman Hastings is a truly great person; funny, passionate, smart, graceful, witty, and everything I’d hope to see in a politician. He offered us advice, “learn a language.” He told us a comedic story of his mother’s own insistence that he do the same. Words cannot do justice to the people we met, the things we say. No matter how much I’d like to describe how great all these people we met were, the only real way to find out is to meet them yourself. I’ve always been a skeptic about politics; in four hours, these wonderful people have not only restored my faith in both the system and humanity, but also made me seriously consider politics as a possible career for myself. Twelve years worth of forming my own opinions, suddenly challenged by four hours on Capitol Hill. Today was a truly inspiring and life-changing this experience.